In this 1996 image, a woman who was wearing a leg brace, which reduced mobility of her left knee, was about to enter a grocery store through its automatic, electronic eye-controlled doorway. Being that the doors were automatic, it reduced the amount of effort needed by all who'd enter the doorway, which included those experiencing reduced mobility such as this woman with an impaired gait. 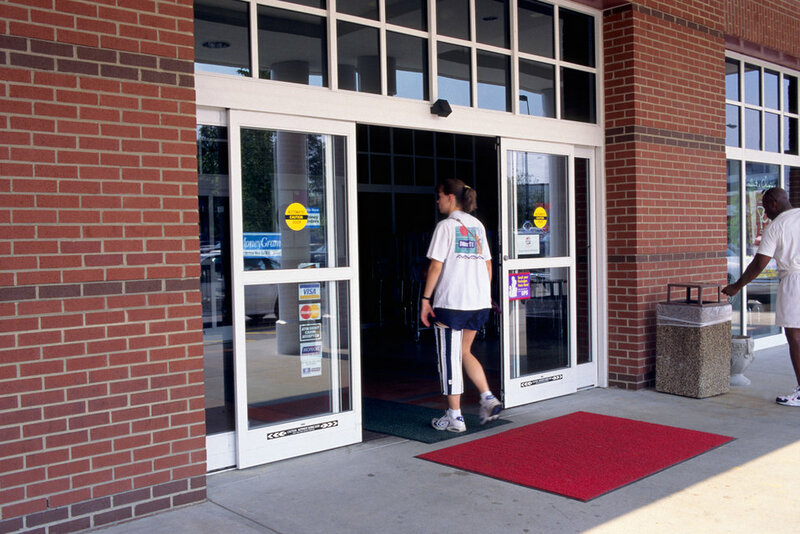 Widely used, 'no-touch' automatic doors accommodate all types of users, including the mobility-challenged, as well as those whose hands are filled with purchases. Simple, and in common use, the wide automatic door is an excellent example of Universal Design. Other facilities should, where possible, consider this option.